The GMAT Tutor is a two-person tutoring company based in Los Angeles. The company was started by Matt Kirisits, a UCLA MBA graduate (class of 2009.) Matt has taught the GMAT for over five years for both full-length classes and individual students. He currently runs the business and blogs about the GMAT here. Matt is also working towards his CFA charter and has passed Levels I and II. We currently have two tutors available in Los Angeles. Both are UCLA Anderson graduates. See our tutor page here. We currently have two GMAT tutors available in Los Angeles. Both of our tutors have scored in the 95th percentile on the actual GMAT. Detailed biographies of our tutors can be found here. Our tutors take a holistic approach to GMAT tutoring that focuses not only on exam content, but also on other issues that arise during the MBA application process. See a description of our tutoring approach here. The GMAT Tutor was founded by Matt Kirisits. 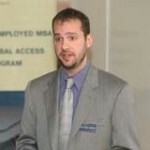 Matt graduated from the UCLA Anderson School of Management in 2009 and has tutored the GMAT for over five years. During that time, he wrote many blog posts about GMAT strategy, which can be found here.